Peet’s light-footed achievement as a writer-director is to cast himself as a kind of seductive force, leading the audience to form conclusions based on what we know and what we think we know about this married couple based on how the images and sound are juxtaposed. It’s a breezy, often visually ambitious (though not ostentatious) and funny film that packs a lot of influences into its brisk 10-minute running time— De Palma, Chabrol, the brothers Coen and Dardennes, even a touch of the airy visual elegance of Vincent Minnelli make themselves known as threads in the fabric that Peet weaves into his own audacious blend. 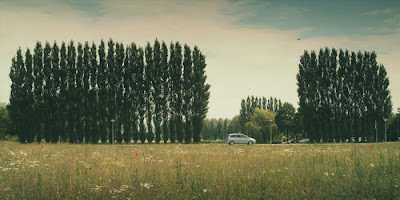 (His director of photography, Rogier den Boer, works subtle miracles with the digital RED camera to give the movie a richness that belies its tiny budget.) But it’s the sound, augmented significantly by T.J. Kong’s original score (based on the couple’s telephone ringtone), that supplies the movie’s gossamer connective tissue and Peet, proving himself to be a fine conductor, brings the emotion of the film to a fully unexpected crescendo by making each word, each noise significant in its own particular way. 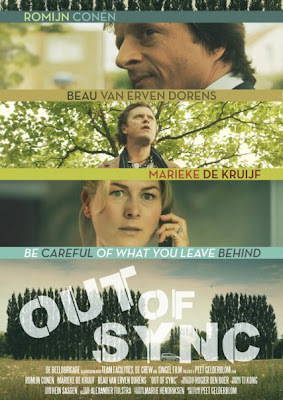 Out of Sync is a lithe, playful, haunting film, and it offers plenty of evidence that Peet, already an accomplished television director in the Netherlands, has with this one film mastered the short form. He’s ready for his feature-length close-up, Mr. De Mille. Peet is taking the movie on the arduous festival trail at the moment, and the film’s Facebook page will allow you to keep up on all the latest developments, including when and where the movie will be publicly available for viewing. (Go ahead, do it—become an Out of Sync Facebook fan!) The movie’s official web site also provides an excellent look at Peet’s ideas about the film, lots of stills, and a wonderful look inside the making of the film which, for me especially, was a real treat. I’ve known Peet for five years and only just this past fall spoke to him directly (a video conference via Skype) for the first time, so to get this glimpse into what it’s like on a Peet Gelderblom set was a unique privilege and the perfect confirmation of what I’ve known all these years—that Peet is a terrific, friendly, welcoming and very talented fella. 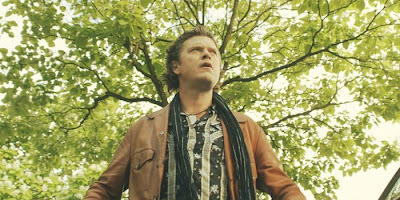 The making of OUT OF SYNC from Peet Gelderblom on Vimeo.